Login using the “Webmaster” Login link at the bottom of the site. Choose the “Top Nav” menu among the tabs at the top of the screen. Drag and drop to reorder the navigation items. 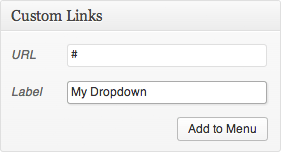 To make a dropdown menu, first create a placeholder menu item. The URL should be a pound sign, and the Label should be whatever you’d like to call this group of pages. The one menu item that won’t appear in your menu is the “Home” link. It’s inserted into the page for you, and will always be the first item.